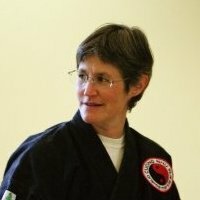 Didi Goodman holds the rank of 6th degree black belt in Cuong Nhu, a Vietnamese martial art that blends principles and techniques drawn from several Vietnamese, Chinese and Japanese martial art styles. She began training in Taekwondo in 1976, later adding Aikido to her practice. In 1988 she was introduced to Cuong Nhu, an art that seemed to combine her two major martial arts interests, while offering opportunities to broaden and deepen her skills over a lifetime. She has dedicated herself to Cuong Nhu since then. In 1992, she founded Cuong Nhu Redwood Dojo in Oakland, California, where she serves as chief instructor. Master Goodman has been teaching traditional martial arts to students of all ages for more than 25 years, during which time she has worked with, and learned great lessons from, many hundreds of children. Her first (reluctant) experiences teaching kids are recounted in the article “Learning from Children: Five Easy Lessons for Teachers,” in the 1991 book Martial Arts Teachers on Teaching, edited by Carol Wiley. She is profiled in Sharp Spear, Crystal Mirror: Martial Arts in Women’s Lives, by Stephanie Hoppe, and in the e-book Many Paths, One Destination: Nine Martial Artists Share Their Journeys, which you can download here.